There are two philosophers, who are taken to be generally representative of Evidentialism. These two philosophers are David Hume and C.K. Clifford. These two philosophers have two quotes that are examplars of their Evidentialism thesis. They are, respectively, as follows. Those quotes from these three writers are taken as representative of Evidentialism, and thus the Evidentialist Principle. The statements they make might appear to carry some validity & they might even seem to be sound. However, Karl Popper holds that they are not valid. He also doesn’t hold that they are sound. They even contradict all empirical systems or all empirical propositions. They forbid us from ever believing or holding to any empirical system or empirical proposition, they forbid us from ever believing or holding to any scientific hypothesis or scientific proposition. But the problem of Induction applies to both the truth of this matter of fact assertion and the probability of the truth of this matter of fact assertion. Both of the propositions contain signs of being based on Induction. Hume points out that a wise man will fix their judgements on a proposition when the evidence indicates that it is probable. Clifford points out that we may infer from experience what goes beyond our experience, but this is based on hypothesis that unknown is similar to the known. Both of the propositions show that Evidentialism is founded on Induction, or inductive inferences. Hume, supposedly, showed that it is logically impossible to infer the unknown from the known. It is logically impossible to derive the unknown from the known. Thus, Evidentialism is founded on a logical impossibility. “The problem of the source of our knowledge has recently been restated as follows. If we make an assertion, we must justify it; but this means that we must be able to answer the following questions. Popper presents the Evidentialist Principle, in that quote, as saying that “If we make an assertion, we must justify it“. If you make an assertion, then you must justify it, or making an assertion implies must justify the assertion. You would have to answer one question, ‘How do you know? What are the sources of your assertion?’, and have to answer another question, ‘What observations (or memories of observations) underlie your assertion?’. As Popper points out, the Evidentialist Principle is an answer to The Problem of Source of Knowledge. So we may suppose that Evidentialism and Induction are to be based on the Source of a proposition or an empirical proposition. It seeks that the source of a proposition to be justified. With the Genetic Fallacy, a proposition is being discredited, or supported, because it is “paying too much attention to the genesis of the idea rather than to the reasons offered for it”. The origin, or source, of the proposition is used to discredit, or support, the proposition. Evidentialism would discredit a proposition because the source of the proposition is without justification. We also find that David Hume presents an example of the questions that Popper finds to be unsatisfactory. “All reasonings concerning matter of fact seem to be founded on the relation of cause and effect. By means of that relation alone we can go beyond the evidence of our memory and senses. If you were to ask a man, why he believes any matter of fact, which is absent; for instance, that his friend is in the country, or in France; he would give you a reason; and this reason would be some other fact; as a letter received from him, or the knowledge of his former resolutions and promises…All our reasonings concerning fact are of the same nature. And here it is constantly supposed that there is a connexion between the present fact and that which is inferred from it. Were there nothing to bind them together, the inference would be entirely precarious. David Hume himself goes down the line of questioning that Popper brings up. For example, suppose that some assertion is made like “all ravens are black”. This assertion is what Hume calls a Matter of Fact, i.e. Synthetic proposition or Contingent proposition. It is Possible that it is true that “all ravens are black” and it is possible that it isn’t true that “all ravens are black”. This starts a line of questioning once this assertion is presented. Question: What is the nature of reasoning concerning that matter of fact? Evidence: The assertion is founded on the relation of cause and effect. Question: What is the foundation of reasoning and conclusion concerning that relation of cause and effect? Evidence: The relation of cause and effect of that assertion is founded on Experience. These two questions follow a basic form that Popper is bringing up, and the type of basic form that Popper finds unsuitable, or the type of basic form of Evidentialism that is unsuitable. The basic reason for this is because another question follows from the answer to the previous two questions. Question: What is the foundation of that conclusion drawn from experience? This new question is where the Problem of Induction arises, or what Popper calls The Logical Problem of Induction. If all Ravens are Black then justified in the relation of cause and effect. If justified in the relation of cause and effect then justified by experience. If justified by experience then experience is justified by Induction. So if all ravens are black then justified by Induction. But, Induction isn’t justified. So assertion all ravens are black isn’t justified. Therefore, Evidentialism would make it so that the assertion all Ravens are Black isn’t justified. This applies to all matters of fact, and thus all empirical and scientific assertions. The Problem of Induction comes about because Induction relies on statement that is a matter of fact assertion, but this matter of fact assertion cannot, in principle, be inductively justified. So either all reasonings concerning matter of fact seem to be founded on experience or not all reasonings concerning matter of fact seem to be founded on experience. This is a logical problem because either Induction relies on a statement that is either a contingent proposition or necessary proposition. We can call this the “Principle of Induction”. But the Principle of Induction can’t be a necessary proposition because the negation of the Principle of Induction is possible to be false. A necessary proposition can’t be possible to be false. So it is possible that Principle of Induction is true and it is possible that isn’t true that Principle of Induction is true. Therefore, the Principle of Induction is a contingent proposition. Hume points out that matter of facts about dispositions and universal propositions are matters of facts. Thus dispositional propositions and universal propositions are contingent propositions. Dispositional propositions describe law-like behavior and universal propositions describe lawful behavior or law-like behavior. These would both be contingent propositions, and so we wouldn’t be justified, based on Induction, in asserting those dispositional propositions or universal propositions. We wouldn’t be justified, based on Evidentialism, when it came to assertions about dispositional propositions or universal propositions. Science wouldn’t be justified, based on Evidentialism, when it came to assertions about dispositional propositions or universal propositions. But science is full of assertions about dispositional propositions and universal propositions. Therefore, science wouldn’t be justified in asserting dispositional propositions and universal propositions. The assertion “all ravens are black” isn’t justified as true under Evidentialism and “all ravens are black” isn’t jusified as probably true under Evidentialism. Hume himself points out that the wise man doesn’t fixate his judgement on an assertion in which the evidence exceeds what we properly call probability. In other words, the Evidentialist doesn’t hold to assertions in which the evidence exceeds what we properly call probability. So Evidentialist only hold to assertion in which evidence shows it is true or probably true. So “all ravens are black” is only held by an Evidentialist if evidence shows it is true or at least probably true. Popper presents a solution to the Problem of Induction, and thus treats assertions differently from Evidentialism. Popper rejects Induction, and thus rejects Evidentialism. The source of an assertion has nothing to do with either discrediting the truth of a proposition or supporting the truth of a proposition. Matter of fact propositions, or scientific propositions, don’t discredit or support the source of an assertion. Science doesn’t support the truth of a proposition or support the probability of a proposition. It, basically, seeks to discredit the truth of a proposition. Science seeks to show that the proposition is false, not that the proposition is true or probably true. Science always seeks to discredit it’s proposition and not to support it’s propositions. So scientific propositions are, in principle, possible to show they are false and never show they are true or probably true. This includes both dispositional propositions and universal propositions. In other words, Evidentialism seeks both positive justifications for assertion and negative justifications for assertion. Evidentialism would be based on “full decidability”. Falsifiability, or Falsification, seeks only negative justifications for assertions. Falsifiability would be based on “partial decidability” . These negative justifications, for Falsifiability, basically state that scientific assertion hasn’t been demonstrated false as of yet. This never indicates a positive justification for the assertion being true or probably true. For Falsifiability, the source of an assertion is irrelevant when judging whether the assertion is either true or false, and the source of an assertion is irrelevant when judging whether justified in believing that assertion is true or probably true. The source of an assertion is irrelevant for the justification of the assertion. Would have to rely on Induction, and Induction isn’t justified itself. The only justification of an assertion, specifically an empirical assertion, is that it is possible to show that assertion is false. An empirical assertion has the possibility to be shown false, but it doesn’t have the possibility to be shown true (or probably true). Science, thus, doesn’t care of the source of an assertion. Science is justified in believing, or holding to, an empirical proposition because that empirical proposition allows for the possibility that can be shown that it is false, but hasn’t been shown that it is false yet. For example, science would be justified in believing the empirical proposition that “all ravens are orange” if wasn’t for “some ravens are black”. It would be a negative justification, since don’t have another empirical proposition that contradicts it, or shows that it is false. One of the basic mechanisms of Falsifiability is that works by deductive inference. Modus Tollens forms an example of deductive inference that Falsifiability uses. Given the conditional claim that the consequent is true if the antecedent is true, and given that the consequent is false, we can infer that the antecedent is also false. If an empirical assertion is true implies another empirical assertion is true & the other empirical assertion is false, then original empirical assertion is false. Principle of Modus Tollens:If all ravens are orange implies no ravens are not orange & some ravens are black, then not all ravens are orange. This is how the negative justification of empirical assertions works, which is deductive inference of modus tollens. It wouldn’t be possible for “not all ravens are orange” to be false. So it must be true. The Principle of Modus Tollens is a necessary truth, which is different from the Principle of Induction. The Principle of Induction isn’t a necessary truth. It is possible that the Principle of Induction is false. So it might be true. An assertion that is the conclusion of the Principle of Induction, or the assertion of a wise man that reviewed the Evidence, might be true. An assertion that is the conclusion of the Principle of Modus Tollens, or the assertion of a foolish man that never reviewed the Evidence, must be true. The truth that the Principle of Modus Tollens always produces truth. It is similar to negative theology. It isn’t true that “all ravens are orange” & it isn’t true that “no ravens are not orange”. Each time saying what is true because true isn’t those false statements, since it is true that “not all ravens are black”. The contradiction between “all ravens are orange” and “not all ravens are orange” are exclusive, they both can’t be true and no intermediary empirical propositions between them. If know that “all ravens are orange” is false then know that “not all ravens are orange” is true. All ravens are orange implied no ravens are not orange & some ravens are black. Therefore, it is necessarily true that not all ravens are orange. If Know that “not all ravens are orange” is true then “not all ravens are orange” is true. “Not all ravens are orange” is true. Both the Principle of Modus Tollens are dealing with scientific propositions. The scientific propositions are possibly true or possibly false. If combine scientific propositions with the Principle of Induction, then scientific proposition infered might be true. If combine scientific propositions with Principle of Modus Tollens, then scientific proposition infered must be true. The negative justification allows for things that aren’t possibly not true & hold to statements that are only true, while positive justification allows for things that are only possibly true & hold to some statements that aren’t only true. So Evidentialist like David Hume, or C.K. Clifford, would be justified in holding some scientific propositions that aren’t only true. Evidentialist would hold to both true statements and false statements. While the Non-Evidentialist, which follows Falsifiability or negative justification, would hold only to true statements. The Non-evidentialist wouldn’t be justified in asserting a scientific statement, even though conclusions drawn from it must be true. Thus, Evidentialism is fallacious because the assertions that it concludes to be justified in holding, based on the evidence, aren’t truth-preserving. It’s conclusions of justified scientific propositions aren’t based on the evidence or derived by positive support it receives from the evidence. However, it is completely opposite with Non-Evidentialism of Falsification, or it isn’t fallacious. The Evidentialist would be acting irrationally by seeking their justification, while the Falsifiabilist, which is necessarily a Non-Evidentialist, would be acting rationally by not seeking the Evidentialist justification. 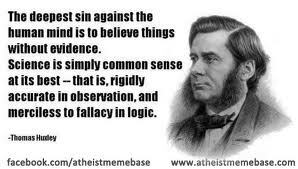 Huxley’s assertion, in his examplar of Evidentialism, mentions that “merciless to fallacy in logic.” But we later find out that Evidentialism isn’t “merciless to fallacy in logic”, but is founded on a fallacy in logic itself. David Hume recognized this, even though exemplar of Evidentialism. Instead, he went about acting irrationally by seeking a (positive) justification of proposition by evidence & the rest of Evidentialism followed, like C.K. Clifford and Thomas Huxley. They would all go about by searching for evidence that proposition is true and end right back in the same place. So we finally come full circle with the fallacy of Evidentialism, and find the source of the Evidentialist fallacy.